The digital world has become a red sea. Everyone has a website and everyone is fighting for a strong presence on the web. But only some are utilizing a website content strategy. To be exact, only 37% of businesses are using a website content strategy. Without a strong strategy for the web, you’re leaving the success of your website up to fate. So, if you’re interested in creating or improving your B2B content marketing, you’ve come to the right place. In this post, we are going to discuss why creating a digital content strategy is so important and how to do it successfully. Content strategy is a written plan to manage any of the media your business handles on its own. This could include written, downloadable, or visual media and even social media marketing. Your digital content strategy is the piece of the puzzle that helps you convey your brand and sets you apart in your industry. As businesses, we hear it all the time – content is king. But to have content that results in the growth of your business, you need to have a purposeful plan behind it. Just like your business, your content should have a specific customer in mind. This goes for the platform you post your content on and the type of content you post as well. Having a variety of targeted content can help to engage each demographic your company does business with. You don’t need to limit yourself to one type of customer either. If your product or service can cater to both men and women, you can create two sets of content that is specific for each gender. The same concept can be applied to any type of other specifics including age and media type. How does your business solve a problem? The purpose of a business is to solve a specific problem. Your content should be crafted with the entire life cycle of this problem in mind. Meaning that your content should help people on all sides of the problem – whether they are still figuring it out, or they are seeking immediate solutions. As we mentioned at the start, everyone is fighting for a spot on the web. Which makes standing out as important as ever. Your potential customers need to know exactly why your business is better than any of the others. You have to prove you’re worth listening to before you can prove you’re worth buying from. How will content be managed, created, and published? To have a successful content strategy, you need to have a solid organizational foundation. It doesn’t matter how great your content is if it never gets posted. The best way to manage content is from a topic cluster standpoint. A topic cluster is built around one broader, pillar topic that spirals off into more defined, specific topics. Planning your content calendar around your topics can help you convey your brand and makes you look great to Google – and who doesn’t want that? Why do I need a content marketing plan? The importance of a content marketing plan can be summed up in just one word – growth. Content is a reliable source of website traffic and can help increase your business’s ability to generate revenue – ultimately allowing it to grow. Plus, content that helps educate users and generate awareness will create loyal, returning customers. How do you create a content strategy? What’s your “why”? Why do you want to develop a content strategy? What are you hoping to achieve? Understanding your goals before diving in can help you tailor your strategy to your business’s specific needs. The content you develop should be relevant to your target audience. The end goal here is to convert users into customers, so they have to want to read your content. This is accomplished by making your content topically relevant and valuable. But in order to know how to make it valuable, you need to establish your target audience. Who do you want to see your content? Who do you want to buy your products or services? Figure out which kinds of content you want. There are endless platforms for which you can create content including blog posts, ebooks, infographics, case studies, templates, videos, social media, podcasts, and more. Figure out which type of content is best for your target audience. Then build your content strategy around that. Decide on a management system. Although having a content management system in place isn’t necessary, it can be helpful. There are a couple of reliable ones out there like WP Engine that help you plan, produce, and publish content. If you choose to forgo a management system, just make sure you have a dependable plan in place for content creation, publication, and analysis. By this point, you should have a better idea of who are targeting and what you need to do to accomplish your goals. From there, you can create the specific topics you wish to build off of. Remember to try to build a topic cluster. If you can’t come up with something on your own, there are free resources such as HubSpot’s Blog Ideas Generator and Blog About that can help you get the ball rolling. Get your content out there and manage it. 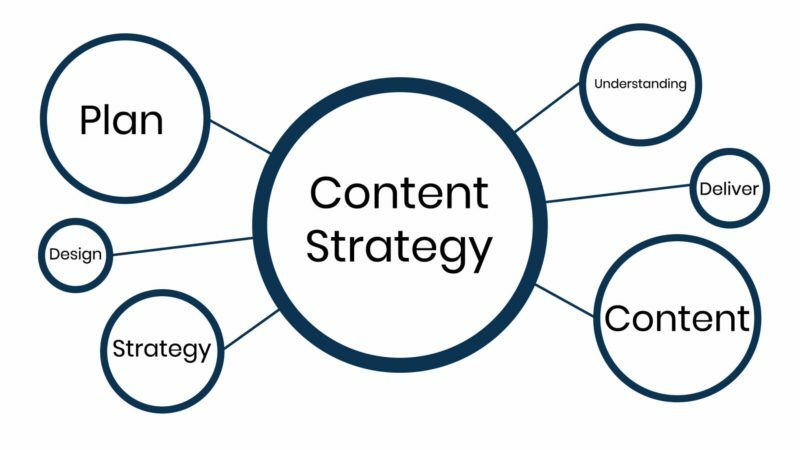 A good content strategy doesn’t stop at the types of content you’ll create – it also plans for the organization of that content. You can use an editorial calendar or a social media content calendar to help keep track of publishing, promotion, and management of the content on all of your sites. Creating a solid content strategy takes time, patience, organization, and a whole lot of creativity. But taking the time to develop a content marketing plan will pay off in the long run. From setting goals to publishing and analytics, laying out your content strategy for the year ahead won’t be a headache if you follow the 6 steps above. If you need additional guidance, Charley Grey can help! We are a web design agency who designs, develops, and manages high performing website. Our team can help you establish a solid content strategy and achieve the growth you’re looking for. Let’s talk more about it over coffee! Give us a call at (317) 991-1982.